Running back Latavius Murray, punt returner Marcus Sherels and guard Nick Easton signed with the Saints in the offseason. With the Vikings’ first preseason game scheduled for Aug. 9, the team figures to first have its full roster in Eagan for training camp on July 25, the first day veterans can report. The team has brought rookies, quarterbacks and injured players to camp early in recent years for extra work. 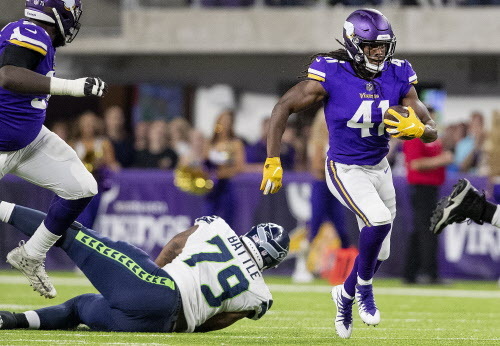 For a second consecutive year, the Vikings will play the Seahawks in the preseason and regular season. The NFL released preseason matchups on Tuesday afternoon with the remaining dates and times to be announced. The Vikings will open the exhibition slate at New Orleans against a Saints team that signed three of their free agents this spring in running back Latavius Murray, punt returner Marcus Sherels and guard Nick Easton. Minnesota’s second exhibition will be nationally televised against the Seahawks on Fox. Kickoff is set for 7 p.m. on Aug. 18. A trip to CenturyLink Field in Seattle is also scheduled for this fall. The full NFL schedule should be released this month. The Cardinals will serve as the Vikings’ tune-up game in the third exhibition, in a noon kickoff that will be nationally televised on NFL Network (which will pick up the Vikings’ broadcast of the game). Perhaps it’ll come against a rookie Kyler Murray? The preseason finale comes in Buffalo.